After the lovely weather on Saturday (and Sunday as well if you were lucky enough) thoughts are turning towards the Summer months of al fresco dining, holidays and sunshine. But what if your thoughts aren’t turning to ideas for blog posts and you are stuck for ideas. 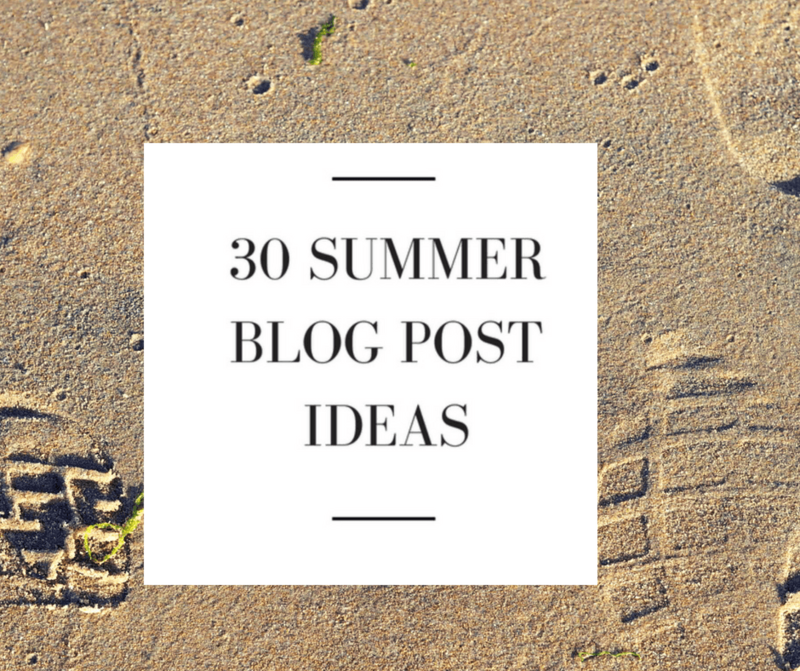 Well worry not, I have 30 Summer blog post ideas for you! I also have Spring blog post ideas as well as Autumn blog post ideas if you want to check them out. Things you love about Summer – list the things you love about this season. What’s In My Suitcase – tell us what you are packing in your suitcase to bring on holiday. Bonus points if you include packing tips to stop your suitcase from bursting open at the airport. Photo Diary – show us pics of your summer holiday and what you got up to. Summer Skincare Routine – let us know what products we should be using to keep our skin protected during the sunny months. How to Host a Summer Garden Party/BBQ – tell us what we need for the perfect summer party. Summer DIY – take a look on Pinterest and get your/the kids craft on. Picnic Basket Ideas – what tasty treats should we be packing for our picnic. Things to Keep Your Kids Entertained – tell us what things we can do to keep the little darlings from saying they are bored. Events in your town or city – let people know of any upcoming events happening where you live such as festivals, markets and shows. Summer Playlist – what will you be listening to on your car journey to go on holiday. Update your Garden – now that the weather is warmer (or more than likely raining if you are in the UK!) and you will be in your garden more show us how you made your garden pretty. Summer Holiday Wishlist – if money was no object where would you most like to go. BBQ Recipes – what grilled goodies will you be serving up at your bbq. Summer/Festival Fashion Wishlist – tell us what you will be wearing this season. What You Will Be Reading – what books should we be taking with us to read on the beach. Summer Cocktail Recipe – what should we be sipping on this Summer. Best restaurants/things to do in……. – tell us where we should be heading to in whichever city you holidayed in. 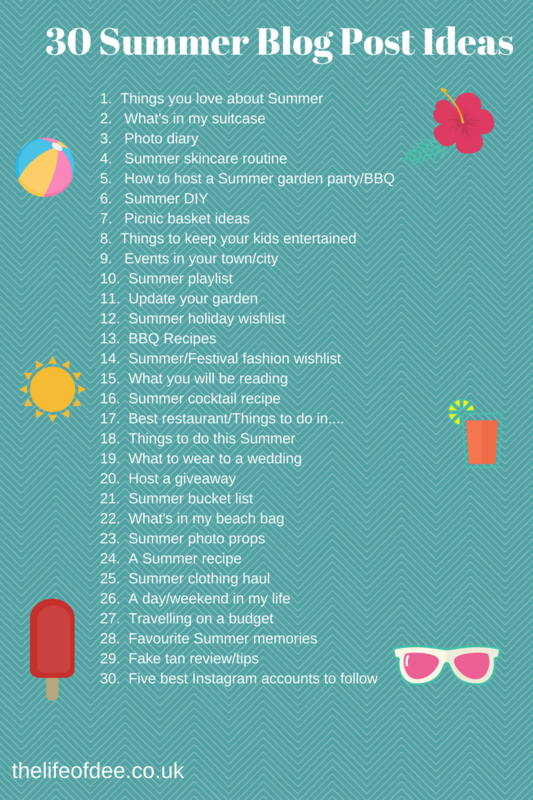 Things to do this Summer – write a list post on things we can do during the Summer months. What To Wear To A Wedding – now that wedding season is upon us show us what outfits we should be wearing. Host a giveaway – is it your blog’s birthday? Or maybe you want to thank your readers? Hosting a giveaway tends to get you more traffic to your blog as well as potential new followers. Summer Bucket List – tell us what’s on this season’s bucket list for you. What’s in my Beach Bag – tell us the must-haves you will be taking down to the beach with you. Summer Photo Props – show us what props you use in your photos for the Summer season. A Summer Recipe – maybe you have a salad, cake or lunch recipe you want to share with us. Summer Clothing Haul – whether it’s for you or for your children show us what you will be wearing this Summer. A Day/Weekend in My Life – tell us what happens in a typical day/weekend in your life. Include photos too or it didn’t happen! Travelling on a Budget – know of any money saving hacks for holidays? Let us know how we can travel for less. Favourite Summer Memories – share your favourite memories from childhood holidays or even more recent. Fake Tan Review/Tips – we all know that it is safer than sun so tell us what your favourite fake tan is and why as well as sharing your tips on how to maintain it. Five Best Instagram Accounts to Follow – tell us who we should be following on IG for food, travel & fluffy cats pics. I hope that you found these ideas useful, have you got any post ideas that you could suggest? "10 Things You Discover When You Become New Parents"
Thanks for the ideas. I’ll definitely do the top 5 accounts to follow. Now I for sure won’t have writer’s block. Great post ideas for this season, I’ll definitely be using a few, thank you for sharing dear.